New York - Sotheby’s Geek Week auctions concluded Friday in New York with a total of $7.4 million, featuring sales dedicated to Space Exploration and The History of Science & Technology. Below is a look at some of the highlights that drove these results. 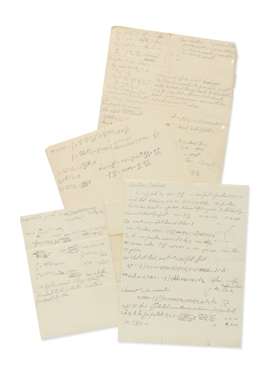 Sotheby’s second annual History of Science & Technology auction was led by the Nobel Prize, papers and books of the brilliant, inspiring, and much-beloved theoretical physicist Richard P. Feynman, which were offered across 42 lots. Spanning the full length of his career - from his early days at Los Alamos and Cornell through his final days at the California Institute of Technology (Caltech), and covering topics such as the atom bomb, QED, Nanotechnology and Computing - the remarkable and enlightening collection of papers are the only known archive of Feynman manuscripts to exist outside of the archive at Caltech, where he taught for nearly 4 decades. In the year of the centenary of Feynman’s birth, his 1965 Nobel Prize in Physics achieved $975,000. The prize was awarded to Feynman along with fellow physicists Julian Schwinger and Shin’ichiro Tomonaga, “for their fundamental work in quantum electrodynamics, with deep-ploughing consequences for the physics of elementary particles.” The three physicists independently developed different ingenious methods to reconcile the electromagnetic field theory of the 19th century with the quantum mechanics theory of the 20th. Feynman’s method involved his invention of the revolutionary ‘Feynman Diagram’ - innovative pictorial representations that provided a clear visual explanation of every possible interaction between electrons and photons. Leading the collection of Feynman manuscripts was a group of papers showing his derivations of the Schrödinger Equation via the Feynman path integral. Illuminating the equivalence of these distinct but complementary formulations of quantum mechanics, the papers fetched $399,000. Another top lot of the collection was an autographed draft for Feynman’s famous lecture "There's Plenty of Room at the Bottom; An Invitation to Enter a New Field of Physics." Widely credited with sparking the field of Nanotechnology, the draft sold for $387,000. In his address Feynman imagined "that we could arrange atoms one by one, just as we want them," and in this spirit he posed two challenges that would lead to the development of the field of Nanotechnology, offering $1,000 dollars each to whomever could 1) construct a tiny motor, and 2) to whomever could fit the entire Encyclopedia Britannica on the head of a pin. Held just a month before the 50th anniversary of Apollo 8 - the first mission to orbit the moon - Sotheby’s second-annual Space Exploration sale was led by the only known lunar samples with clear and documented provenance to be available for private ownership - three moon rocks returned to earth from the unmanned Soviet Luna-16 Mission in 1970, which sold for $855,000. That price nearly doubles the amount achieved when the samples were offered at auction in Sotheby’s iconic Russian Space History sale in 1993. The present lunar samples have remained in the same private American collection since Sotheby’s iconic Russian Space History auction in 1993, when they sold for $442,500 - marking the first time that a piece of another world had ever been offered for sale to the public. The samples were consigned to the 1993 sale by Mme. Nina Ivanovna Koroleva, widow of Sergei Pavlovich Korolev - the former “Chief Designer” and director of the Soviet space program and had been presented to her as a gift on behalf of the USSR in recognition of her late husband’s incalculable contributions to the program. Another highlight of the auction was the exceptionally rare full Gemini Spacesuit - the only known complete American spacesuit to come to market, which fetched $162,500. Built specifically for conducting spacewalks the present suit features gloves that were made for Pete Conrad, the 3rd man to land on the moon, and boots that were made for Frank Borman, one of the first men to ever orbit the moon. Image: Lot 74. Feynman, Richard P. “Two Objectives. (1) To Point out the Peculiar Point. (2) To Formulate a Me in a Definite Number of Assumptions (Non-Relativistic Schröd),” ca 1946-51. Autograph Manuscript. Sold for $399,000. Property from the family of Richard P. Feynman. Courtesy Sotheby’s.